From fine dining, to more treats! Once in a while we usually go away to the mountains. We enjoy these “personal retreats”. The chalets there are quaint, and being up at the foot of the highest mountain in Borneo, it is often cold in the nights. This is why, despite being near the equator, these chalets have nice, soothing modern floor fireplaces built in. Nothing beats having a hot cuppa in one hand and a riveting book in the other, curled up next to a crackling wood fire, inside the house when it is cold and windy outside. The dancing flames and light are therapeutic to the weary body and soul. Now to get the calendar out and compare mine with Hubby’s! Just to add on to my last post about special dinners, I want to make it clear that I am not the only beneficiary to such dinners Ha ha! What do I mean? Behold! 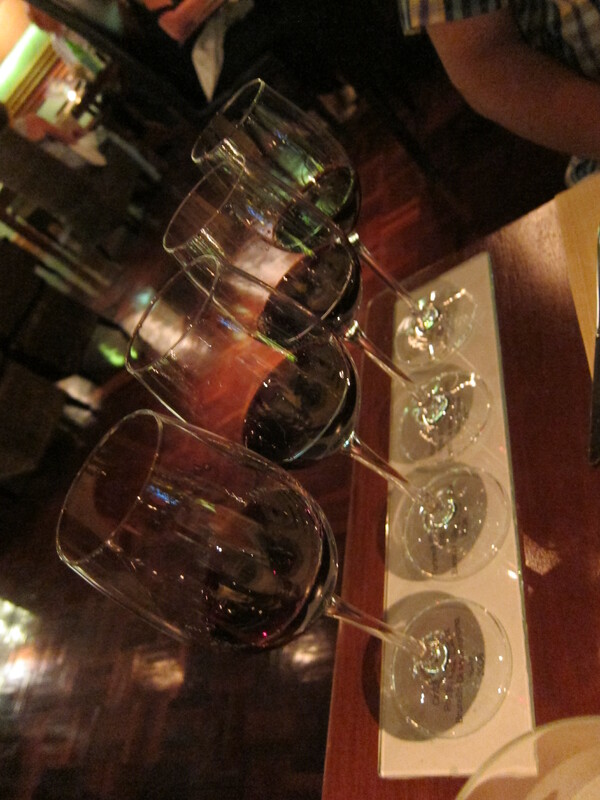 An entire flight of red wines! And I do not drink! (I am allergie to the stuff) So Hubby is the one who gets to enjoy this!